Etobicoke was once a city in its own right. The westward expansion of Toronto has swallowed it up. It has become a tightly integrated part of the Toronto metropolitan area. Etobicoke has excellent access to the rest of the Toronto metropolitan area thanks to highways 401, 409 and 427. Queen Elizabeth Way and Gardiner Expressway pass through the community. On top of this, Line 2 of the Toronto subway and several rail stations connect Etobicoke to the rest of the Toronto metropolitan area. Etobicoke’s history as a distinct city means that it is much more industrialized than other Toronto suburbs. 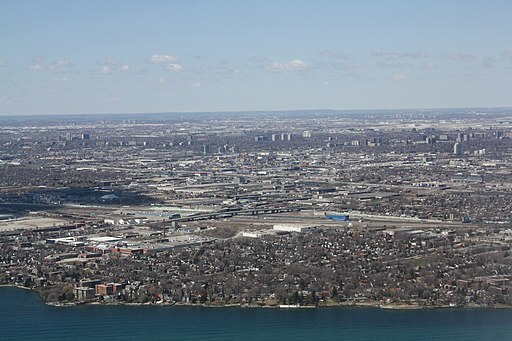 It contains so many industrial buildings that it has a much lower population density than the rest of the Toronto area. Many of these industrial areas are located along the expressways. This makes them targets for residential condominium development site or new townhome sites. Industrial buildings sitting near the train stations are prime candidates for new high-rise condo projects. This only adds to the number of high density apartments already situated across northern and central Etobicoke. The area is desirable because of the many public parks and the main street shopping areas in Etobicoke. There’s no need to compete for apartments in modern town centres in Etobicoke. The community offers older homes in established communities already laid out this way. For example, the postal villages around which Etobicoke formed are the basis for which the modern suburban town centres are modeled. Any commercial or industrial properties near these small town centres are prone to be snapped up for new residential construction, while residents can choose between new dense residential development and historic homes. The demand for new housing is putting significant pressure on industrial property owners. However, shifting economics are increasing demand for industrial and commercial real estate in Etobicoke, too. E-commerce has not eliminated traditional brick and mortar stores. Instead, it is increasing demand for warehouse space, especially warehouses located close to customers demanding same-day delivery. There is an acute shortage of the newer industrial warehouses that ecommerce businesses want, especially the Class-A big bulk warehouses. Etobicoke with its excellent network of highways is exactly where these businesses need their warehouses to be. Yet the growth of ecommerce warehouses and distribution facilities isn’t preventing these businesses from opening retail locations, as well. These firms are also diversifying, moving into a variety of industrial buildings as their business models evolve or they cope with the lack of space. On a related note, Toronto is becoming a major tech hub, adding jobs and creating demand for both residential and commercial real estate. This explains the bidding wars for every potential high-rise condo tower building site. Redevelopment of industrial and commercial properties has cut into the supply of suitable real estate. The overall Toronto vacancy rates for commercial and industrial real estate is below 2%. As a result, landlords have been able to raise their rents per square foot. Supply just can’t keep up with demand, though builders are trying to meet the pent-up demand. New construction is underway, and it is pushing up prices for land as well as construction costs. This ripples through the residential real estate market, increasing construction costs at townhome sites and high-rise condo buildings alike. Several million square feet of industrial space in the greater Toronto area is under construction, but this will not be enough. Yet Etobicoke beats the rest of Toronto in this regard. Industrial and commercial real estate vacancy rates hover near 2% for Toronto as a whole. In comparison, industrial real estate vacancy in Etobicoke is close to 3%. Etobicoke offers many, larger properties for commercial and industrial occupants. For example, you may not be able to find commercial properties with more than 50,000 square feet in downtown Toronto. There are several properties in Etobicoke that are between 50,000-100,000 square feet in size. There are multiple properties in the 100,000-250,000 square foot size range. You can occasionally find commercial properties in Etobicoke that are larger than this, though properties that large are difficult to find in the rest of Toronto. The relative abundance of industrial and commercial real estate in Etobicoke explains why rental rates are 5-10% lower than other parts of the city. Commercial real estate is cheaper in Etobicoke, as well. Don’t expect Etobicoke real estate to become cheap, though. Intense demand for everything from housing to strip centers is driving up land prices. This will push up the price of any future industrial building projects. It also explains the rush by many firms to build now. Real estate development in western Toronto is dominated by build-to-suit projects, both commercial office buildings and industrial buildings. New properties are coming onto the market that will be available for rent to general tenants, but competition will be fierce. Of the estimated four million square feet of speculative commercial real estate being built, at least half was pre-leased in the fourth quarter of 2018. The Financial Post called Toronto the most constrained industrial real estate market in the country. Toronto’s strong economy explains why leasing activity was brisk throughout 2018. While business investment fell along with oil prices last year, businesses continue to invest in real estate. They see the longterm value of owning a building over paying rent to a landlord. Every payment pays down their principal, building equity in the property. The housing market slowdown hasn’t hurt the industrial or commercial real estate market at all. Single family home sales fell by half, while new condo and apartment sells fell by nearly 40%. Office space absorption increased 18%, while industrial space absorption had an amazing 250% change in activity levels in 2018. This was partially due to the drop in new office space completion. 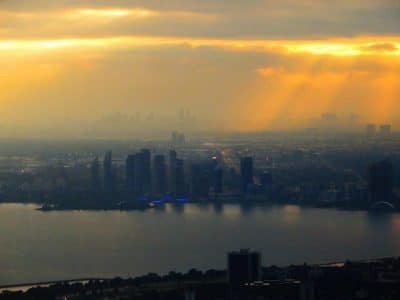 That fell to 650,000 square feet of new space added in the Greater Toronto Area in 2018, the lowest level in fifteen years. Of the nearly twelve million square feet of commercial space under construction in Toronto, roughly ten million of this is in the downtown area. However, the commercial real estate market is seeing increasing demand for suburban locations based on their more competitive rents. Downtown Toronto firms also appreciate having more alternatives to choose from. This will increase demand for commercial real estate in Etobicoke. Property is being snapped up for later development, since raw land prices are increasing along with construction costs. Etobicoke is a relatively affordable commercial and industrial real estate market in the Greater Toronto Area. It provides a number of existing properties of all sizes for those who need to relocate, and it is one of the few areas in the Toronto metropolitan area that still offers sites that are easily developed. Copyright © 2019 Toronto Invest Real Estate All Rights Reserved.